There are many benefits of being active whether it’s via traditional exercises, recreational activities or even a job that requires physical movement. While a sedentary lifestyle can certainly have harmful effects on the mind and body, there are also instances where certain physical activities can also lead to health conditions. One prime example is tennis elbow, an ailment that affects 1% – 3% of the U.S population, according to the Cleveland Clinic. For this condition, a tennis elbow brace is an effective solution to help alleviate the associated symptoms. If you or anyone you know is suffering from tennis elbow; read on as we’ll provide valuable information, tips and treatment options. We will delve deeper into understanding this condition, explaining the main causes of tennis elbow and we’ll also share preventative methods. Repetitive movements of the wrists and arms can lead called tennis elbow– known medically as lateral epicondylitis. It occurs due to repetition of certain arm movements which cause the muscle to develop small tears; as a result, the muscle becomes inflamed. This not only leads to pain –especially on the outside of your elbow– but due to stress on the rest of your arm, gripping or lifting things can also become painful. Sports such as tennis, golf and racquetball can cause this ailment. However, despite the name, tennis elbow can affect athletes and non-athletes alike. Carpenters, painters and plumbers, mechanics and cooks, as well as guitarists are also prone to developing tennis elbow. Moreover, OrthoInfo notes that it is more prevalent with butchers than the rest of the population! While you can suffer from tennis elbow at any age, it more commonly affects people between ages 30-50. Other related hand and elbow conditions include carpel tunnel syndrome, tendonitis, golfers elbow, cubital tunnel syndrome and compression/entrapment syndromes. These conditions affect the elbow, wrist or arm in some way, and sometimes similar treatments to those used for tennis elbow are also used to address these issues. Tenderness and pain on the outside of your elbow. Swelling of the area along with a burning sensation. Pain and stiffness when trying to extend your arm. For mild cases, WebMD suggests a traditional home remedy: an ice pack which can help with pain and swelling. For 2-3 days or until the pain has subsided, you’ll need to ice the area for roughly 30 minutes every 3-4 hours. The condition can also be treated with steroids, physiotherapy, exercise, anti-inflammatory medications or with an elbow support device. The type of treatment employed will depend on the severity of your condition. Steroids- This is injected into the area to temporarily reduce swelling and pain. Physiotherapy- This helps to stretch and strengthen weak muscles. It can also improve the flow of blood to the tendons. Exercise- Certain range of motion can help to increase flexibility, but this should be done under the guidance of your doctor or physiotherapist. You don’t want to risk further aggravation of the muscle. Pain medications- Over-the-counter medications such as aspirin or ibuprofen can alleviate the pain and inflammation of the area. However, these should be used sparingly due to their related side- effects. Elbow support devices– In some cases these can provide immediate relief, as they take pressure off the tendons while protecting the joints and muscles from further strain. Surgery– If alternative measures are taken and there is no improvement after 12 months, and symptoms still exist surgery is then considered. However, according to Jonathan Cluett, MD most people with the condition will never need surgery. Support for tennis elbow comes in a variety of forms. Here we’ll look at some of the most common types. The compression fabric in the sleeve helps to improve blood and oxygen circulation in your elbow, biceps and forearm. It can be used as both a treatment and preventative method for tennis elbow. The compression sleeve is also called an elbow brace and it works by putting pressure on the affected area. Due to the design, it is worn over the elbow and forearm, providing compression for the entire elbow joint. It can be worn during high-intensity sports such as tennis, racquetball or basketball, offering a full range of motion while relieving pain and soreness. Compression sleeves are also specifically designed to help with stiff and sore joints and muscles–while also providing warmth to your elbow and arm. Persons who have strenuous jobs and those who work in cold weather conditions can benefit from using the compression sleeve. 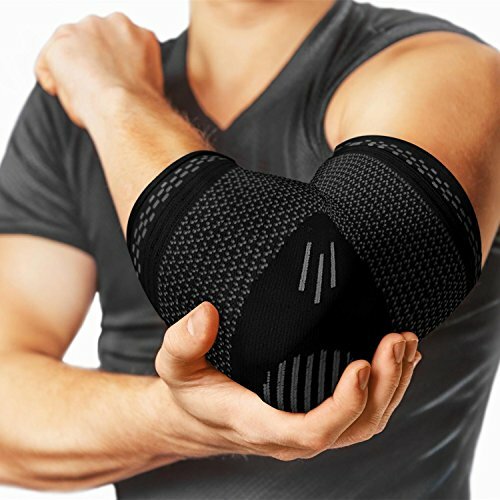 These elbow pads can help alleviate different types of elbow related conditions such as tendonitis, and inflammation of the joints. It is bulkier than other options due to the foam padding which helps prevent injury during physical activities. An elbow pad is more of a preventative method than a solution. It is regularly used by persons who are prone to elbow injuries and want to protect this sensitive area. The straps are much smaller than regular elbow braces, providing coverage for only a small section of the arm. However, the lightness allows for more flexibility and easier range of motion. This is best used for mild cases of tennis elbow or sore joints. It should be placed slightly below the most painful area of the elbow, not directly on the spot. Make sure the item is durable and can withstand your lifestyle. If you play multiple sports or work in a high-intensity job you’ll need a high-quality elbow support that can withstand daily use. Look for an option that has a range of sizes available, and an accurate sizing chart to ensure proper fit. You don’t want a support system that is too tight as this can hinder blood circulation. However, a loose-fitting elbow support won’t provide enough compression to alleviate the pain. Often times finding a support that fits well is the most challenging part of choosing an effective tennis elbow brace. Your elbow support should be made from breathable material that won’t cause the area to sweat or itch. Certain materials might also be comfortable but can easily slip off the area. Try to find something that is smooth on the skin, but is also thick enough to stay in place. A study from the Journal of Orthopaedic and Sports Physical Therapy revealed that tennis elbow braces (strap and sleeve) had an immediate, improved effect on pain-free grip strength. In light of this, if you have pain in your elbow, getting a tennis elbow brace could help. 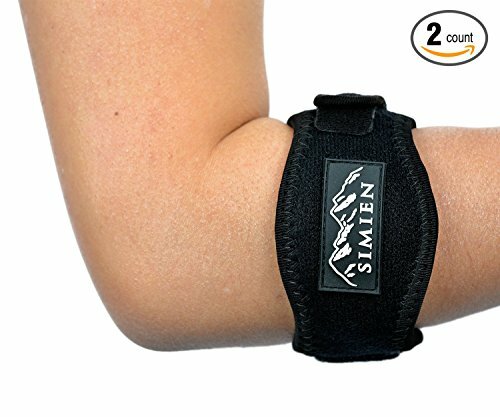 The Simien Tennis Elbow Brace contains a compression ‘gel-like’ pad which helps with the relief of joint pain, and pain related to muscle tissues. It is made from high-quality neoprene and nylon materials. A minor drawback is that this product doesn’t offer enough ‘size’ options. So if you have very small or very large arms you might have trouble finding the correct fit. This brace can also be used as an armband when engaging in physical activities that can cause elbow hyperextension such as basketball or weightlifting. You’ll also get a bonus sweat wristband with your order, plus an E-book titled, Addressing Tennis Elbow Pain. It provides instructions on how to properly use the product and also shares online resources to include therapies and exercises that can help with tennis elbow. This double-set is everything you’ll need to address your muscle related injuries. 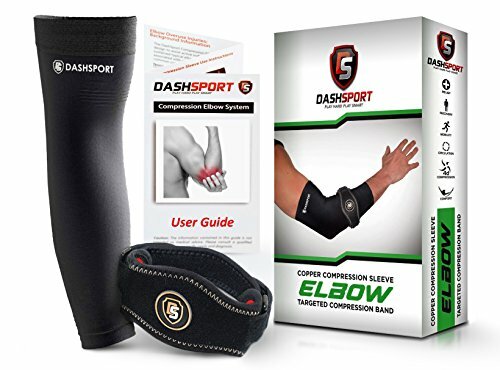 You’ll receive a first-class, copper compression elbow sleeve made with 200GSM fabric. It fits snugly and provides gentle compression; ideal for a full day of support. The set also contains a fully- adjustable, copper-nylon elbow strap which allows you to modify as needed from light to strong compression. The copper nylon material, which is used in both the strap and sleeve is itch-free, odour resistant and contains anti-bacterial properties. The high-performance fabric is uniquely designed to keep you warm during cold temperatures and keeps you cool when the time gets hot. You can choose to pair the sleeve and strap together or use them separately. The Bauerfeind sports elbow strap is the most expensive option on our list. It is made with long-lasting material and is anatomically contoured to fit your arm comfortably and securely. It has a five-point pressure pad which is strategically placed to help reduce pain and irritation by stimulating sprained muscles and other trigger points on your arm. The pad can be placed on either the outside or inside of the durable, easy-to-clean band. This helps with irritation and inflammation of the area by triggering a warning pressure to cushion forces. The strap also has a Boa closure system to easily adjust the tension on the area without restricting elbow movement. If you’re not satisfied with the Bauerfeind Sports Elbow Strap, you can return the device within 30 days of purchase for either a replacement or refund. It also comes with a 1-year warranty against manufacturer defects, which is a benefit over some of the other braces. Ergonomically shaped to fit the contour of your arm and elbow, this strap is also lightweight, allowing full range of motion. Due to this, you can wear the strap underneath your clothing without any added bulkiness. It is made with a medically-certified high-grade polymer, Ethylene-Vinyl Acetate. This is soft and flexible, but it is also durable. The other materials are cotton, lycra and nylon. Furthermore, persons who are allergic to latex– a popular material used in some of the other braces– won’t have to worry about skin irritation. 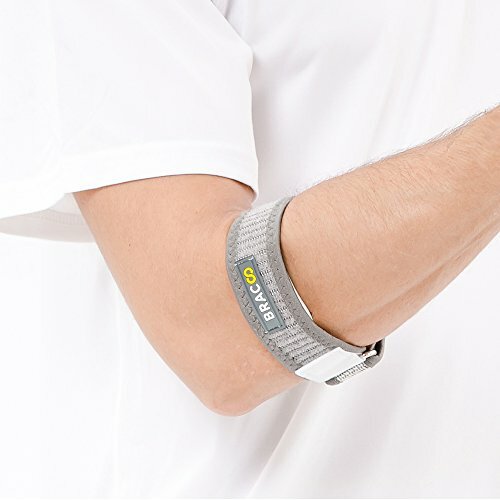 The Bracoo Tennis – Golfer Elbow Strap promises precise pain relief and recovery assistance thanks to the medical- grade EVA pad whether you have golfers elbow, tennis elbow or any other related injury. The strap also maximizes shock absorption as well as vibration damping. These issues are often linked to certain types of jobs such as carpentry, chef, and auto mechanics. This tennis elbow brace is one of the cheapest options on the list. However, if you have large hands you might have trouble finding a size that fits. This elbow brace provides relief from tennis elbow by applying stable pressure across your elbow joints. This elbow support is also made with an anti-slip system and can help to not only ease pain but also improve blood circulation. The device is ergonomically designed with a 4- way compression sleeve allowing you full range arm motion during physical activities that cause strain to the joints. The PowerLix Elbow Brace is made with a high-performance, breathable fabric that helps to minimize injury by offering optimum muscle support. You’ll be able to enjoy exceptional elbow support while still maintaining peak performance during your sporting activities. Sizes are available from small to large, but the sleeve can lose elasticity over time. However the company offers a 6- month warranty and 100% money back guarantee if you are not satisfied with the product. This compression sleeve has therapeutic fibres such as capsaicin and a synthetic cooling agent embedded into the material. These aid in relieving cramps, sprains, sore muscles, and other muscle related aches and pains. It is specifically intended to increase blood flow, reduce swollen muscles and help with the rehabilitation of arthritis, joint inflammation, elbow tendonitis, tennis and golfer’s elbow, along with other types of elbow pain. It also has an anti-slip design to guarantee a firm grip without having to constantly readjust. 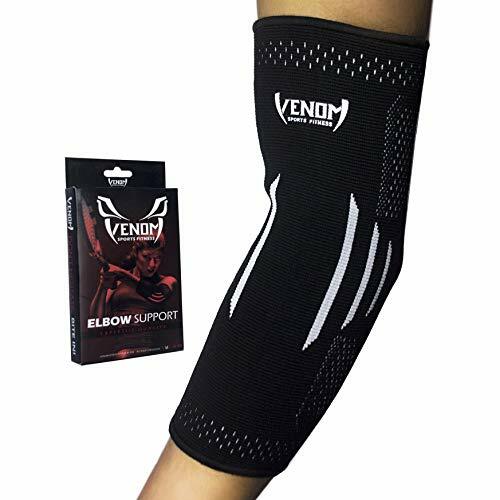 The Venom Elbow Brace Compression Sleeve has sizes available from small to XXL and can stretch to fit. However, the company also offers a free ‘size replacement’ if your tennis brace does not fit correctly. Like the Simien brace, you’ll also receive a bonus PDF guide which contains various recovery exercises for tennis elbow. 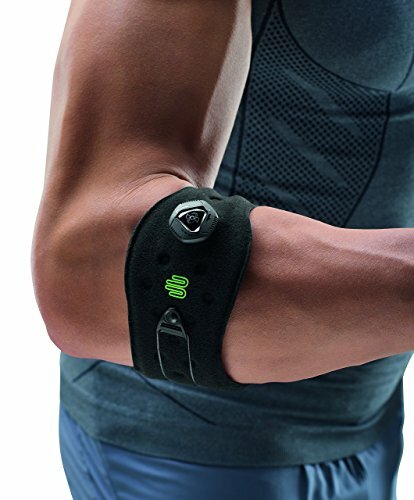 This therapeutic armband by BandIT is uniquely made to fit the forearm. It features a non-constrictive design consisting of two curved soft-plastic plates. These plates– which rest against the skin– have soft cushioned neoprene on the insides and are precisely intended to prevent and relieve tendonitis, carpal tunnel syndrome and tennis elbow pain. It has a loop and hook on the strap, which makes it easily adjustable to your level of tightness without inhibiting blood circulation or restricting movement. This band also reduces muscle spasm and inflammation by generating subtle warmth on the painful area. It encourages the natural healing process of your body by increasing blood flow and oxygen. The small, sleek design makes it unnoticeable underneath your clothing, and it can be worn for long periods of time. The cheap cost is also an added bonus. Not only is it small and easy to use, but this therapeutic band also ranks on the lower end of the price scale. You’ll certainly get your money’s worth as it is ideal for work and home use, and can also be worn during physical activities. This gadget is small but very effective in providing relief for tennis elbow, tendonitis and other related injuries. It is easily adjustable to provide the perfect level of compression, ultimately reducing pain and swelling. 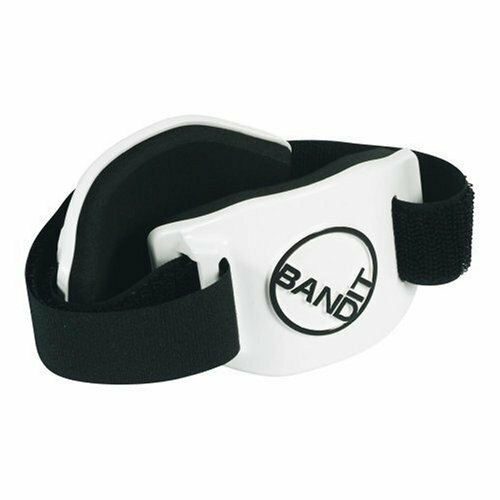 The BandIT Therapeutic Forearm Band can also be worn for long periods of time, and will show improvement with continued use. If you notice any of the signs and symptoms of tennis elbow emerging, visit a doctor immediately to have the condition properly diagnosed and treated. If you engage in a lot of physical activities, take the necessary safety precautions to prevent tennis elbow. Before attempting strenuous activities such as sports or exercise, you should warm up your muscles to prevent injury or strain. The good news is that once you find the right device for your condition, you can experience immediate relief. With continued use of your brace, your tennis elbow will also continue to improve over time.